Stress can contribute to the development of illnesses and disorders such as diabetes and depression. 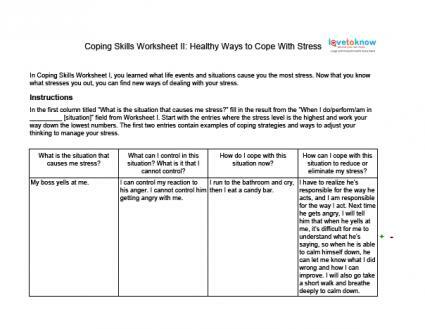 Worksheets are a great way to get you started on your journey coping with your stress in a healthy way. These self-help worksheets are designed to take you on a learning journey. As you follow these steps, you will discover more about your mind-body connection and find new healthy coping mechanisms for the life situations that stress you out the most. Use physiological signs of stress to help you fill out the physical symptoms of stress, and common responses to stress for emotional reactions to stress. Then, fill in all the physiological signs and emotional reactions to stress that are relevant to you, adding anything else you experience that has a negative impact on you throughout your day. The rating scale, although basic, will help you rate the level of stress you feel with each item. This will help you prioritize what events or situations cause you a great deal of stress. Brainstorm and think of the things that cause you the most stress in your life. Don't worry about what order it is in at the moment. Focus on situations that cause you at least a moderate amount of stress. Feel free to list activities and events that do not cause you stress. It will help you think about why they are not stressful and give you a good point of comparison with stressful events. Worksheet II will help you think of new healthier ways to cope with your stress. Since stress begins with perception, an effective way of coping with stress is to change your perception by challenging your thoughts. In doing this, you can change the thoughts that trigger your body's stress response. Use this worksheet after you filled in Worksheet I. In this worksheet, you will learn how to challenge and restructure the way you view and perceive life events and your reactions to them. The first part of the worksheet will help you define what situations you have control over and what situations you can't control. 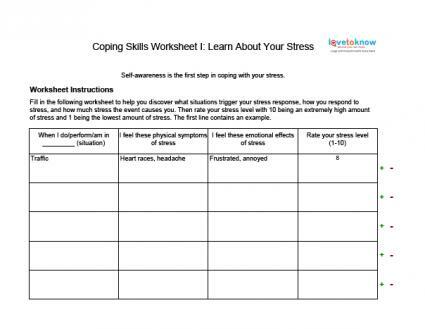 When you fill out this worksheet, take the list from Coping Skills Worksheet I you created. Situations you rated at a ten should go at the top of the list, and list the rest in descending order until you list all of the items. A good way to cope with stress is to establish healthy boundaries. An example of this is not allowing people to yell at you when they communicate with you. Realize that there are situations you can control and cannot control. While you cannot control the person who is yelling, you can control how you react to that person. Identify things you can control and things you cannot control. Are you getting stressed about situations you cannot control? When you are confronted with a stressful situation, how do you react? What feelings do you experience (upset, angry, or frustrated)? Harry had a bad day. His boss didn't like any of his proposals. He learned from his doctor that he needs some tests done. Then he was stuck on a train on the way home for three hours. He wondered what is wrong with him and why his life seems like a roller coaster. Once you identify the way you currently handle stress, you can change unhealthy patterns of behavior for healthy ones. You can create new ways of behaving and thinking that will help you reduce your stress. Gee, my boss sure was cranky today. I wonder if everything is okay with him? I won't worry about the results of the tests my doctor took until I have a reason to worry. Gosh, what bad luck I had getting stuck on that train. Oh, well, bad days happen once in a while. It was rough and I'm glad it's over. I'm sure tomorrow will be better. To download worksheets I and II, you will need Adobe. If you need help, check out these tips. If you are filling out the worksheets on the computer, the cells will automatically wrap and align the text for you, so fill free to fill out each entry with as much detail as you like. If you want to add more rows, click on the "+" sign. Click on the "-" sign to remove rows if you like, or keep them in case you think of other things to add later on. In life, there is rarely just one remedy to solve a problem. People are complex, and often, several strategies must be employed in order to combat a problem. These worksheets can be used in conjunction with cognitive behavioral sessions. If you are a counselor, feel free to share these with your clients to help them manage their stress. If you are already seeing a self-help professional, bring them in with you to discuss what you have learned. As you fill out your worksheets, you can employ other self-help techniques to control or eliminate the stress you feel. For example, to combat a stressful situation, instead of eating a candy bar, you decide to take a walk instead. In this way, you are using exercise to control stress, as well as the worksheet to help you plan how you will change your behavior when confronted with the same situation. Changing one's lifestyle and habits can take time. Stress is often interwoven into our thoughts, emotions, our actions, and our lifestyles. It takes time and patience to work through all the reasons we get stressed and how we can cope with stress in healthier ways. If you feel you need extra support to help keep you on track, or if you are having trouble implementing any self-help technique, don't give up! Take the next step and seek out a mental health professional. Mental health professionals specialize in helping people find new ways of coping that are better for their health, longevity, and emotional well-being.